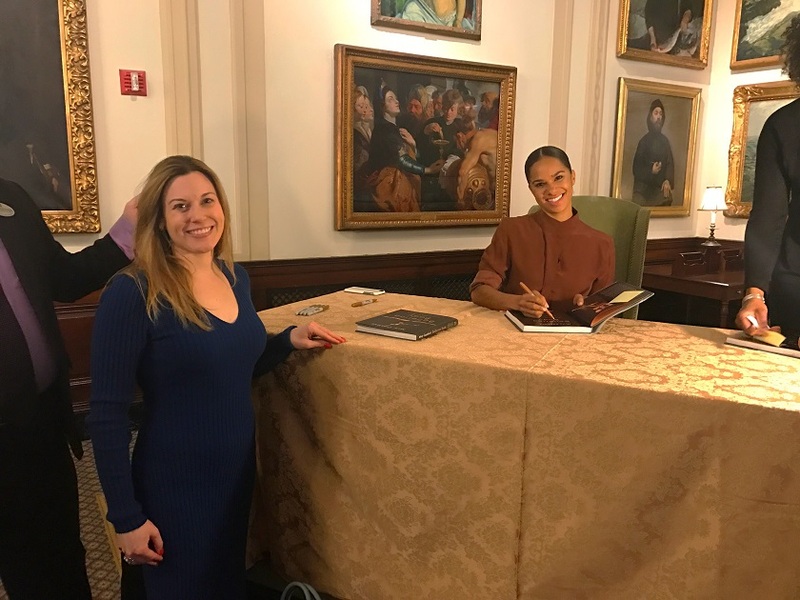 I had the esteemed privilege of meeting the exquisite Misty Copeland, the first African American principal dancer of the famed American Ballet Theatre, at a recent book signing for her wellness treasure Ballerina Body. I was immediately struck by the crowd of young girls anxiously awaiting in line to great their idol. How amazing that these young ladies have an accomplished role model to look up to as opposed to some reality star?! Misty was full of poise, beauty and grace. Not to mention, she was extremely humble with amazing life lessons to share. Never give up and tune out the naysayers. Misty encountered many adversities in her life and individuals trying to discourage her success, but that did not stop her from pursuing her passion. When you believe in yourself and maintain a positive attitude anything is possible. Focus! If you want to be outstanding; you need to work hard every day. Misty may be the principle ballerina, but she still takes daily ballet classes, devoting herself to her craft. It’s all about practice, practice, practice and consistency, consistency, consistency. Whether your goal is to lose weight or get a promotion at work, you have to be willing to work diligently and make sacrifices along the way. I couldn’t tell myself that [I wouldn’t recover]. I had to almost lie to myself because I didn’t know what was going to happen. I had to say, “You’re going to,” and just keep working. Misty never gave up on her dream and neither should you. If you want something bad enough stay strong and find a way to make it happen. What you put into your body is just as important as how hard you dance. I believe with the right training and an understanding of how to take care of your body, you can mold it to be whatever you want it to be. The reason I’m so passionate about healthy living is because I truly believe if you want to rock your life, you need to create a solid physical foundation. Maintaining a healthy diet and exercise regimen gives you confidence and energy. Plus being a doggy Momma is the best stress reliever in the world. Speaking of which, just like me with my sous chef Gatsby, one of Misty’s biggest stress relievers is cooking. She puts on some tunes and rocks her stress away. Finally, surround yourself with positive mentors and friends. Throughout Misty’s candid conversation it was clear to me that she was blessed with many wonderful mentors and friends. I’ve immensely admired the wonderful friendship my Momma shares with her two soul mates Pam and Jeanne. The “posse” as they call themselves has stood together through thick and thin. We all need a network of friends and mentors to support us in our endeavors in both the joyful and difficult times. This is truly the reason I created our community Rockstar Doggy Momma as a safe place for like-minded women to have fun, learn, be inspired and support one another. Now go out there and rock your life!